Goodreads Summary: When sixteen-year-old Tess Kendrick is sent to live with her older sister, Ivy, she has no idea that the infamous Ivy Kendrick is Washington D.C.'s #1 “fixer,” known for making politicians' scandals go away for a price. No sooner does Tess enroll at Hardwicke Academy than she unwittingly follows in her sister's footsteps and becomes D.C.'s premier high school fixer, solving problems for elite teens. Sounds good! I love Scandal and Pretty Little Liars, so I'll check this book out. YES! If you love Scandal you have to check this one out, thanks for stopping by! YES! I love Jenny Lynn Barnes! Her books are amazing and she's a sweetheart. She's also brilliant! Great pick! I've been seeing this title around the blogs today - it sounds really enticing! I definitely will be checking this one out when it hits stores! Thanks for sharing! I know! 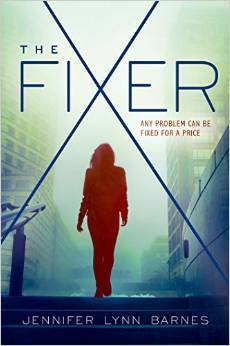 The Fixer has been all over blogs, and I'm so excited for it :) Thanks for stopping by! Great choice! I can't wait for this one either. I think it's on Netgalley too if you want to request a copy! Doesn't sound like it's my kinda book, but it still sounds pretty good! I hope you get your hands on it soon and I'd love to hear what you think about it! I'm not really a fan of contemporary books but this one sounds like it could be really good. I will have to check it out when it comes out. I hope you enjoy it! I know it's been getting some stellar reviews so far, so I hope you'll enjoy this, Patrick!